Our leadership award is designed to celebrate true leaders who selflessly and fearlessly lead their teams to new heights of excellence. 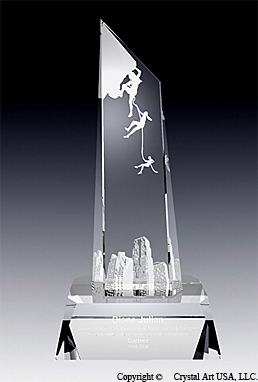 This award features silhouettes of two team members being supported by their leader while climbing a mountain cliff. An image of a cityscape shines in the background. The cliff symbolizes business challenges teams overcome while striving for success.